Gazef is the Warrior Captain of the Re-Estize Kingdom. He is the King's personal bodyguard and considered to be the Strongest Warrior of the Re-Estize Kingdom. He is loyal to his King and the Kingdom. 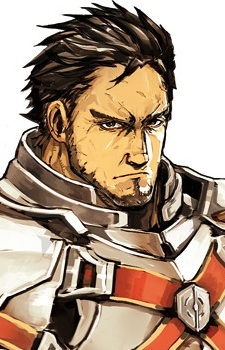 Gazef is a strong-willed man and is willing to sacrifice his life in order to protect the people of the Kingdom. He shows respect and admiration to those under his command. Gazef was born as a commoner in the frontier village and became a mercenary. He entered the grand tournament to acquire the king's trust and became his personal bodyguard after becoming the champion by defeating Brain Unglaus. As the Kingdom's strongest warrior, he is extremely famous, commanding the respect and admiration of all those who know his name. As only nobles can become a "Knight" in the Kingdom, Gazef commands his own "Warrior Troops" instead. Ainz Ooal Gown later attempts to recruit Gazef in exchange for stopping the war between the Kingdom and the Empire. Gazef declines and instead challenges Ainz to a duel. Stopping time using Delay Magic, Ainz instantly kills Gazef using Delay True Death, disallowing Gazef any time to react. In the web novel version, Gazef survives the massacre.